Black Acer VX2631-UR11 is a compact- fairly light and small desktop PC that is only about 30 percent the size of a regular PC but in a contemporary and progressive design, with a 4th generation Intel i3 processor, sufficient RAM for multitasking power, efficiency and speed, good sound and graphics for home entertainment- videos, songs, photos and some games as well as any of your daily tasks. Acer VX2631-UR11 has a 4th generation Intel Core i3-4130 processor (3MB Cache) at 3.4 GHz, 4 GB DDR3 UDIMM RAM memory, 500 GB Serial ATA/300 at 7200 rpm hard drive and 64-bit Windows 7 Home Premium operating system.. You have both the snappy performance and less power usage with the Haswell i3 processor, 4GB RAM is plenty for any of the multitasking of your day-to-day stuff and can be upgraded up to a maximum of 16GB if you need more memory. 500GB hard drive gives ample space of storage for your videos, music, photos and other common files. You have the integrated Intel HD 4000 graphics for nice images and all right gaming performance. The high definition Audio with 5.1-Channel Surround Sound Support for very clear sound with the right kind of speakers like you have a home theatre system. You’ll find the most often used ports at the lower front part of the PC tower (2 x USB 3.0 ports, Audio Line In and Audio Line Out, Digital Media Card Reader- Secure Digital (SD) Card) and the 16X DVD±R/RW SuperMulti Drive in the middle so that you can burn CDs and DVDs, listen to music and watch movies, then it has the 10/100/1000 Gigabit Ethernet LAN with RJ-45, 2 Expansion Slots- 1 x PCI Express x1 Slot- 1 x PCI Express x16 Slot, an HDMI port, a VGA port and a DVI port. It comes with a standard yet comfortable USB keyboard and an optical mouse. The soft front surface with metallic finish modern Acer is simple to set-up and will save on space with its dimensions of 14.49 x 4.02 x 10.51 inches and the weight of 13.7 pounds, which also make it relatively portable for a desktop. It will fit anywhere easily with its space saving design and size, both vertically or horizontally. It is a rather quietly working machine and a cool one too, even after being on all day long. Acer VX2631-UR11 comes with a 12 month limited parts and labor warranty as well as decent customer service and toll-free technical support if you encounter any issues. 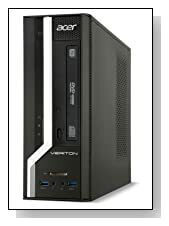 It is an environmentally friendly desktop PC with Green Compliance Certificate (RoHS). 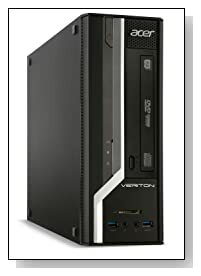 Conclusion: The Veriton 2 series Acer VX2631-UR11 actually has a few selling points: Firstly it comes with a Windows 7 OS system that is not easily found these days- most computers have the Windows 8 pre-installed, then you have the energy efficient and powerful Intel i3 processor, a great range of connectivity ports in the right- convenient places, good amounts of hard drive and memory that are easy to upgrade (open the top bit by just unscrewing 2 screws), decent graphics and sound, small and lightweight- space saving portability factor then you have the low price tag for all that you’re getting. But this is not a full-on gaming or multimedia editing machine either, so keep that and the low price in mind. If you’re in the market for a super powerful desktop PC, you will need to spend lots more.